With 1,070 entrants the $1,500 PLO tournament at the 2011 World Series of Poker was the largest PLO tournament in the history of poker, and despite the huge field the final table was stacked with poker talent. Amongst the players making the final 9 were online superstars David “Doc” Sands, and Emil “WhiteLime” Patel, not to mention Jeff Sarwer, the former Canadian Chess Champion turned poker pro who has been tearing up the European poker circuit. Despite the well-known names it was Elie Payan who would walk away from the tournament with his first WSOP bracelet, and the second WSOP bracelet of 2011 for France. 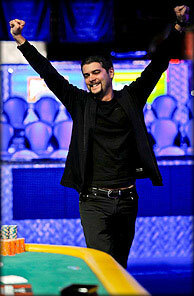 The win was by far the biggest of Payan’s career, considering the biggest buy-in tournament he had entered prior to the $1,500 PLO at the WSOP was €310 tournament on the Partouche Poker Tour according to thehendonmob.com’s database. The nearly $300,000 in prize-money is over 10-times his career totals up to this point! This entry was posted on Thursday, June 16th, 2011 at 11:40 am and is filed under Poker News. You can follow any responses to this entry through the RSS 2.0 feed. You can leave a response, or trackback from your own site.